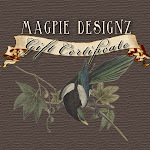 Magpie Designz has officially passed the one year mark!!! After 2600 sales on etsy.com, 1000markets.com and NOW my very own site at magpiedesignz.com, I feel proud and amazed at the overwhelming response to my jewelry business endeavor. Who would of thought I could quit my day job and focus completely on creating art? I never did, and here I am, pinching myself every morning as I walk into my studio. This past year has taught me a lot. Mostly that I can achieve what I set out to do but also a belief that hand made items still do have a place in today's market. Thank you to my friends and family who have helped and encouraged me when I wanted to give up. And most of all thanks to my customers that have passed on my name with high regards and continue to come back. I happened to catch you first thing! I am following, I reposted on FB and just re-tweeted! Will blog soon and post new comment - love your designs. Just beautiful. Love your stuff! I just shared this blog on Facebook and I am trying to figure out how to follow your blog...thanks for the opportunity to win some of your great stuff! OK..I just figured out how to follow your blog...following now...YAY! Just posted on my blog - so check, check, check, check! yay!! I posted on facebook and joined your blog! became a follower and reposted on fb. Very happy for your success! You make such unique jewelry. Posted on FB. Hi, Emily! Since I'm already a follower, I posted a link to your site on my facebook account. Do you have a facebook page that I can become a "fan" of? Yes Lauren, my facebook fan page is facebook.com/magpiedesignzjewelry. Thanks!! This is a great necklace. I would love to have a chance to win it. I put it on facebook and am a fan! I am following your blog, reposting on FB and I am now re-tweeting. Thanks!! I am now following your blog, I posted about the giveaway on FB, and I am re-tweeting about it as well right now.... Thanks! Posted on facebook and following your blog. Can't wait to decide which necklace I want to order. Ok, I guess I did something wrong. Hey Em! I just became a follower and facebook-ed about your blog. I hope you guys are well...miss you! I'm a new follwer and I'm so excited!!! Your stuff is so pretty!! I'm a new follower and I reposted on FB! I am a follower on your blog and posted on FB. I will be blogging about your jewelry that I got from Rich & Jen but I first have to catch up with my blog stuff. But I've started following you! Great job....I love your jewelry. I am following your blog, a fan on FB, and posted on FB. I love your jewelry - keep up the great work!